HLA class I presentation of pathogen-derived peptide ligands is essential for CD8+ T-cell recognition of Toxoplasma gondii infected cells. Currently, little data exist pertaining to peptides that are presented after T. gondii infection. Herein we purify HLA-A*02:01 complexes from T. gondii infected cells and characterize the peptide ligands using LCMS. We identify 195 T. gondii encoded ligands originating from both secreted and cytoplasmic proteins. Surprisingly, T. gondii ligands are significantly longer than uninfected host ligands, and these longer pathogen-derived peptides maintain a canonical N-terminal binding core yet exhibit a C-terminal extension of 1–30 amino acids. Structural analysis demonstrates that binding of extended peptides opens the HLA class I F’ pocket, allowing the C-terminal extension to protrude through one end of the binding groove. In summary, we demonstrate that unrealized structural flexibility makes MHC class I receptive to parasite-derived ligands that exhibit unique C-terminal peptide extensions. Toxoplasma gondii is a parasite that can infect most warm-blooded animals and cause a disease called toxoplasmosis. In humans, toxoplasmosis generally does not cause any noticeable symptoms, but it can cause serious problems in pregnant women and individuals with weakened immune systems. T. gondii is one of many parasites that hide within human cells in an attempt to avoid detection by the immune system. However, proteins called Human Leukocyte Antigens, or HLAs, can reveal hidden parasites by carrying small sections of them from the inside the infected cell to the cell’s surface. The immune system can then recognize the fragments as foreign and attack the parasite. HLAs typically pick up parasite fragments of a certain length, which enables the immune system to recognize that what is being displayed is a piece of parasite. By purifying HLAs from cells that have been infected by T. gondii, McMurtrey et al. have now learned more about which fragments of the parasite are displayed to the immune system. This analysis revealed that the parasite somehow manipulates the HLAs to carry parasite fragments that are considerably longer than can be explained with our current knowledge of how HLAs work. By using a technique called X-ray crystallography, McMurtrey et al. also show that the structure of the HLA assumes a previously unseen configuration when interacting with fragments of T. gondii. In the future, it will be important to understand how infected cells give rise to unusual structural configurations of HLAs and to unravel how these structures affect the immune system’s ability to fight infections. CD8 T-cells mediate immunity to Toxoplasma gondii infection (Khan et al., 1988; Suzuki and Remington, 1988) through recognition of peptide antigens presented by the MHC class I (MHC I) molecules of infected cells (Brown and McLeod, 1990; Deckert-Schlüter et al., 1994). The majority of peptide ligands identified to date are derived from parasite surface proteins, proteins localized to dense granules, or the rhoptry proteins which are specialized secretory granules whose contents are released either into the host cell cytoplasm or the parasitophorous vacuole (Blanchard et al., 2008; Cardona et al., 2015; Cong et al., 2011). These secreted proteins are thought to be optimal candidates for MHC I presentation because they have the best access to conventional antigen processing and presentation machinery in the host cell. However, this is a large pathogen, and the full array of parasite proteins that might be sampled and presented remains unknown. Recent advances in immunology and proteomics highlight that non-canonical ligands are presented to T cells by MHC I molecules. While a majority of peptides are 8–11 amino acids in length, MHC I molecules present a considerable number of peptides >11 amino acids (Hassan et al., 2015; Schittenhelm et al., 2014) that elicit T-cell responses (Hassan et al., 2015; Burrows et al., 2006). Structural characterizations suggest that these long ligands interact with the MHC I molecule much like canonical peptides: The MHC I alpha chain forms a 10 x 25 angstrom groove in which peptide ligands are anchored by their second (P2) and C-terminal (PΩ) residues. In this mode of binding, the middle portion of any oversized peptides can bulge out of the MHC I groove and interact with the receptors of T lymphocytes (Tynan et al., 2005). Crystallographic studies have confirmed this bulging model, although there exists a structural example of a 10mer interacting with MHC I molecule HLA-A2 via P2 and P9 with an amino acid extension at P10 (Collins et al., 1994). Thus, both peptide extension and peptide bulging have been observed for MHC I ligands, and, as longer ligands become increasingly evident, the interaction of these ligands with MHC I will need to be clarified. The goal of this study was to have the MHC I of infected cells inform the number, breadth, and nature of T. gondii peptide ligands. HLA-A*02:01 was purified from cells infected with T. gondii and peptide ligands eluted from the HLA class I (human MHC I) complex were analyzed by two-dimensional LCMS. 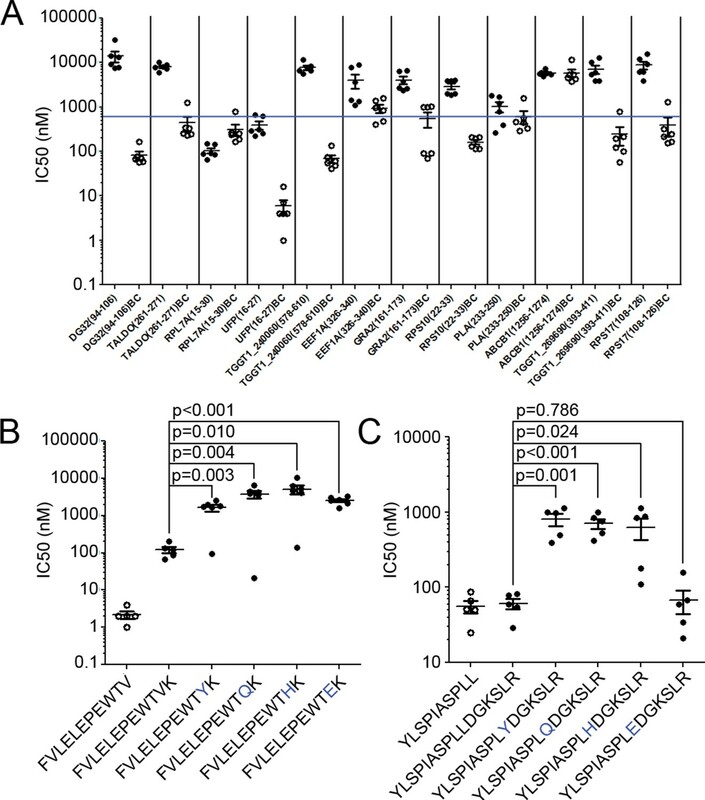 The resulting data demonstrate that nearly 200 ligands originating from close to 100 different T. gondii proteins are sampled for MHC I presentation. As envisioned, a number of ligands originating from dense granule proteins was observed (Blanchard et al., 2008; Cong et al., 2011), yet MHC I ligands were also derived from a large number parasite cytoplasmic proteins. Surprisingly, T. gondii ligands were significantly longer than existing structural models can accommodate, and a series of peptide analogs demonstrated that these longer peptides are not anchored to MHC I via their C-termini. Crystallographic studies reveal an unreported structural re-arrangement of residues in the MHC I binding groove that accommodate C-terminal peptide extensions, and this structural flexibility is discussed in the context of infection by intracellular pathogens. The first objective of this study was to identify pathogen-encoded ligands made available by MHC I. To accomplish this objective, HLA-A*02:01 was purified from T. gondii infected THP-1 monocytes as described. (McMurtrey et al., 2008; Wahl et al., 2009). To ensure THP-1 cells were infected, the number of infected cells and free parasites were periodically assessed. Over the course of a 1-week infection, the number of infected cells increased from 12.1% day 1 post infection to 71.5% on day 7 post infection (Figure 1). A steady increase in the number of free parasites in the culture media from day 1 to 7 was indicative of a productive infection. The production of 12 mg HLA-A*02:01 from infected cells was sufficient for a comprehensive analysis of T. gondii peptide ligands. Kinetics of the T. gondii infection in the bioreactor production. (A) Raw flow cytometry data and gates of the samples taken from the bioreactor on each indicated day post infection. (B) Histogram of the percent of infected cells (black bars) as well as the normalized free parasite counts (blue line). Raw parasite counts were normalized to the total counts of each respective experiment. Peptide ligands eluted from HLA complexes were separated by offline HPLC fractionation and subjected to nanoLCMS. A total of 284 peptide sequences precisely matched the reported sequence of T. gondii. Strikingly, 89 of these peptides were either an exact match or contained an isobaric Ile/Leu ambiguity match to sequences of the H. sapiens host species (Supplementary file 1), leaving 195 ligands definitively derived from T. gondii (Supplementary file 2). Of these confirmed T. gondii derived ligands, most (159) show little (<50%) similarity to H. sapiens while 36 peptides have >50% similarity. 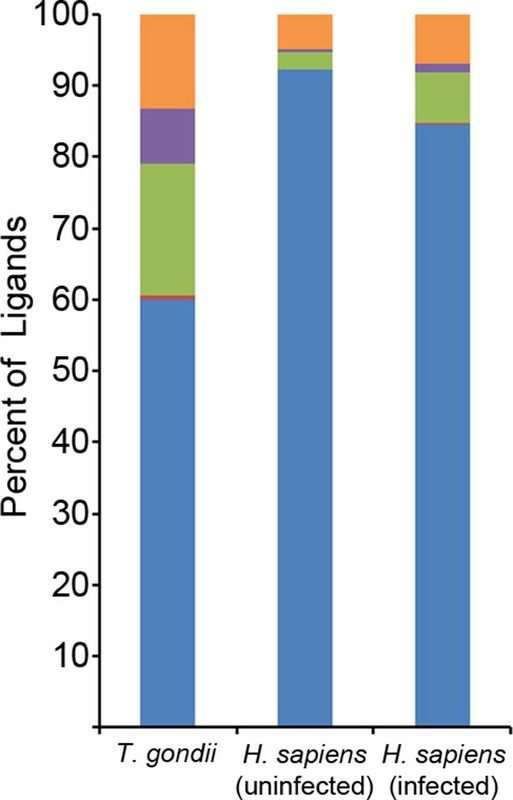 In summary, 31% of the T. gondii derived ligands are identical to H. sapiens sequences, 13% show host similarity, and 56% of the T. gondii ligands have no similarity to host proteins (Figure 2). MHC I makes hundreds of parasite-encoded ligands available to the immune system. Sequence identity of identified T. gondii ligands to H. sapiens. T. gondii derived sequences were BLAST searched against the NCBInr H. sapiens proteome. Sequence identity was recorded and ligands with <50% sequence identity were considered not significant and were binned together. 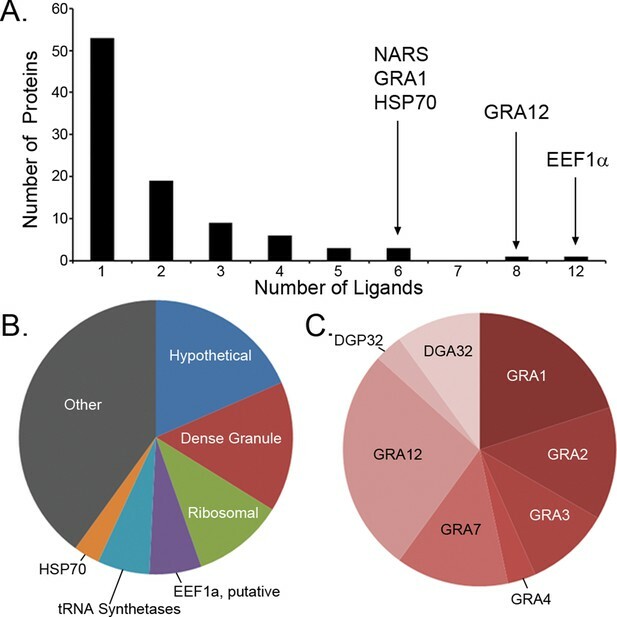 Previous studies have focused upon dense granule proteins (GRA) that are secreted by T. gondii into the cytosol of the host cell, and a handful of GRA ligands have been reported (Blanchard et al., 2008; Cardona et al., 2015; Cong et al., 2011; 2012). In our dataset, the 195 T. gondii ligands identified originate from 95 different proteins of which 87 are non-GRA proteins, demonstrating that a considerable number of proteins are accessible to MHC I presentation. For 55.8% of the T. gondii source proteins a single peptide was presented (Figure 3A), while elongation factor 1 alpha provided 12 peptide ligands. Peptide ligand enrichment from particular proteins was not due to protein length as median protein lengths were not statistically different (Kruskal-Wallis test, p = 0.247) regardless of the number of ligands embedded within a protein (Figure 3—figure supplement 1). Amongst the proteins sampled more than once, a hierarchy emerged whereby several hypothetical proteins were most frequently sampled followed by the dense granule proteins, ribosomal proteins, EF1α, tRNA synthetases, and HSP70, respectively (Figure 3B, Supplementary file 2). 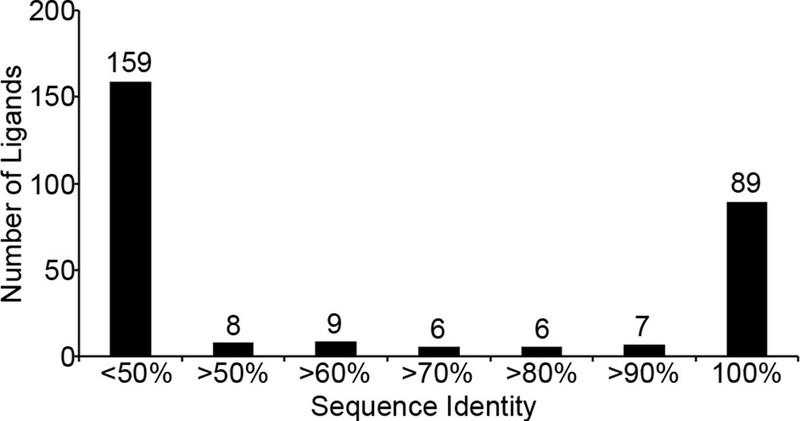 All together, multiply sampled T. gondii source proteins provided 44.2% of the pathogen-derived ligands. Dense granule proteins have been reported as a source of peptides (Blanchard et al., 2008; Cardona et al., 2015; Cong et al., 2010; 2011; 2012; El Bissati et al., 2014), and here 30 GRA ligands (15%) were observed with GRA12 providing the most (Hassan et al., 2015) peptide ligands (Figure 3C). The secreted GRA proteins represent a minority protein source in the rich ligand landscape of this pathogen. Ligand sampling of source proteins. (A) The number of distinct ligands from a given source protein was counted binned by number of ligands. Gene symbols of the most sampled proteins are shown above the respective bin. (B) Distribution of ligands by source protein group or individual source protein. (C) Distribution of ligands by source dense granule protein. In the search for trends and biases in T. gondii peptide ligands, we tested for significant enrichments in cellular compartments of sampled source proteins. There was a significant enrichment in proteins localized to the apical part of the T. gondii cell (GO:0045177, p = 1.50 x 10-8) and to the parasitophorous vacuole (GO:0020003, p = 2.79 x 10-6). Unexpectedly, there was a significant enrichment in proteins originating from the parasite cytoplasm (GO:0005737, p = 9.31 x 10-4) with 21 of 95 proteins annotated as cytoplasmic. This enrichment in peptides derived from T. gondii cytoplasm proteins shows that T. gondii does not sequester cytoplasmic proteins from host MHC I antigen processing and presentation. A recent study showed that the C-terminal location of an epitope within the source protein was important for T. gondii ligand presentation and immunodominance (Feliu et al., 2013). Given this observation, we assessed the location of ligands within their source proteins to determine if a C-terminal bias was maintained. Normalized ligand position was calculated as described by Kim et al. (Kim et al., 2013) and were binned into 5 positions with the most N-terminal bin being 0–0.2 and the most C-terminal bin being 0.8–1.0 (Figure 4). When the T. gondii ligands were compared to the baseline uninfected ligand distribution there was a significant reduction in N-terminal peptides (bins 0–0.2, p = 2.36 x 10-4 and 0.2–0.4, p = 2.23 x 10-4, comparison of proportions) along with significant enrichment in ligands from the C-terminal end of the protein (bins 0.6–0.8, p = 1.46 x 10-2 and 0.8–1.0, p = 5.26 x 10-7). There was no significant change (p = 0.238) to the central ligands (bin 0.4–0.6). Next, host-derived ligands from the infected and uninfected cells were compared to see if the C-terminal bias of pathogen encoded peptides extended to the infected host. There was significant reduction in the 0.2–0.4 bin (p = 0.007) with a significant increase (p = 0.0095) in the very C-terminal bin (p = 0.0095). In summary, T. gondii ligands are significantly enriched from the C-terminal end of their source proteins and host-derived peptide ligands shift towards the C-termini of their respective source proteins following infection. Location of ligands within respective source proteins. Normalized ligand location within the respective source protein from the unambiguous T. gondii ligands (black), H. sapiens ligands from infected THP-1 cells (white) and, H. sapiens ligands from uninfected THP-1 cells (grey). Our in depth proteomics approach identified thousands of HLA-A*02:01 peptide ligands of a canonical length of 8–11 as well as ligands of non-canonical length. Noteworthy is that a number of the T. gondii ligands were much longer than expected for the HLA-A*02:01 molecule (Figure 5). When compared with the host-derived ligands, the T. gondii ligands were significantly longer (t-test, p<0.001) with an average length of 14.6 amino acids compared with 11.4 amino acids in the host ligands from the infected cells and with 9.8 for uninfected host ligands. This increase in host ligand length following infection was statistically significant (t-test, p<0.001). Thus, infection increases the length of T. gondii and host-derived ligands. Length distribution of identified ligands. Length distributions of unambiguous T. gondii ligands (red), H. sapiens ligands from infected THP-1 cells (purple) and, H. sapiens ligands from uninfected THP-1 cells (blue). To investigate how long peptides observed following infection might bind to MHC I, in silico algorithms were used to predict HLA-A*02:01 ligand binding affinity. NetMHCpan 2.8 predicted that 117 of 195 ligands (60%) bind at a percentile rank score <=10%, leaving 78 predicted non-binders (Figure 6). As these long peptides were purified from the HLA-A*02:01 of infected cells, we hypothesized that the predicted non-binders interact with HLA-A*02:01 in a non-canonical fashion that escapes algorithms trained on canonical binding data. A subsequent search revealed nested core sequences of 8–11 amino acids within the longer peptides that were not predicted to bind, and these cores were predicted to bind to HLA-A*02:01. Strikingly, a considerable number (52/78) of the predicted non-binders contained nested core sequences of 8–11 amino acids that were predicted to bind with high affinity (percentile rank score <=2%). This was significantly more (p = 1.2 x 10-10, comparison of proportions) than if the sequences were randomly scrambled (13/78). Hence, a binding core appropriate in length and sequence for interaction with HLA-A*02:01 was embedded within long T. gondii peptides. Binding prediction analysis of eluted ligands. Percentage of total ligands in indicated dataset that are predicted to be canonical binders (blue), contain a C-terminal binding core (red), contain an N-terminal binding core (green), contain a central binding core (purple), or not predicted to bind (orange). We next assessed the positioning of binding cores within longer ligands. Within the T. gondii ligands, most (36/52) binding cores were at the very N-terminus with the peptide extending from the core’s C-terminus (Supplementary file 3). This occurred significantly more than randomly scrambled versions of the peptides (1/13) (p = 3.1 x 10-5, comparison of proportions). There was no significant increase in proportions of ligands with an N-terminal extension (1/52) or an extension on both sides (15/52) compared to scrambled ligand sequences (0/13 and 12/13 respectively). Noteworthy was that 10/15 of the peptides with predicted extensions on both sides of a central core had an alternate binding core at the N-terminal side with a predicted affinity slightly weaker than the central binding core (Supplementary file 3). So, most peptides could bind either at the N-terminal end or in the center, and many of the ligands with central cores possessed an alternate N-terminal core. Among the N-terminal binders, the average C-terminal extension was 8.7 amino acids and the extension varied considerably from 1 to 30 amino acids (Supplementary file 3). In summary, most of the long T. gondii predicted non-binders had an N-terminal binding core with a considerable C-terminal extension. The observation of C-terminally extended peptides among the T. gondii derived ligands prompted a similar analysis of the host ligand repertoire from infected cells. Among ligands from uninfected cells, 2.3% had a C-terminal extension - the baseline of extended peptides in uninfected THP-1 cells. After T. gondii infection, the percentage of host ligands with a C-terminal extension significantly increased to 7.2% (p<0.0001, comparison of proportions) (Figure 6), a percentage that is less than half the T. gondii derived ligands with extensions (18.5%). Thus, T. gondii infection results in C-terminally extended host ligands being nearly 3 times more frequent and T. gondii C-terminally extended ligands being eight times more common. The observation of nested binding cores at the N-termini of extended ligands suggests a novel interaction of T. gondii peptides and MHC I. To confirm that the N-terminal portion of the peptides were binding to HLA-A*02:01, we synthesized full-length peptides and their corresponding binding cores and determined their affinities for HLA-A*02:01 in a competitive binding assay. Twelve ligands having binding cores with the highest predicted binding affinities (Supplementary file 3, bold) were selected for testing in this manner. Of these 12 peptides, eight binding cores bound with high affinity (<500 nM), three with moderate affinity (<1000 nM), and one had no affinity – the N-terminal cores overwhelmingly bound to HLA-A*02:01. Two of the twelve full-length ligands (YLSPIASPLLDGKSLR-RPL7A15-30) and FVLELEPEWTVK-UFP16-27) also bound with high affinity (Figure 7A) even though predictions ranked them as non-binders as their C-termini were incompatible with the HLA-A*02:01 binding motif. The remaining 10 long peptides did not bind in this in vitro assay, perhaps because they are incapable of binding in the absence of molecular chaperones or the distinct conditions of the infected cell. These data confirm that the N-termini of extended peptides have a strong affinity for MHC I. Binding affinity of extended ligands and their respective binding cores. (A) Measured IC50 of extended peptides (black fill) and the respective predicted binding core (white fill). Blue line denotes 500 nM; binding affinities below this are considered binders. 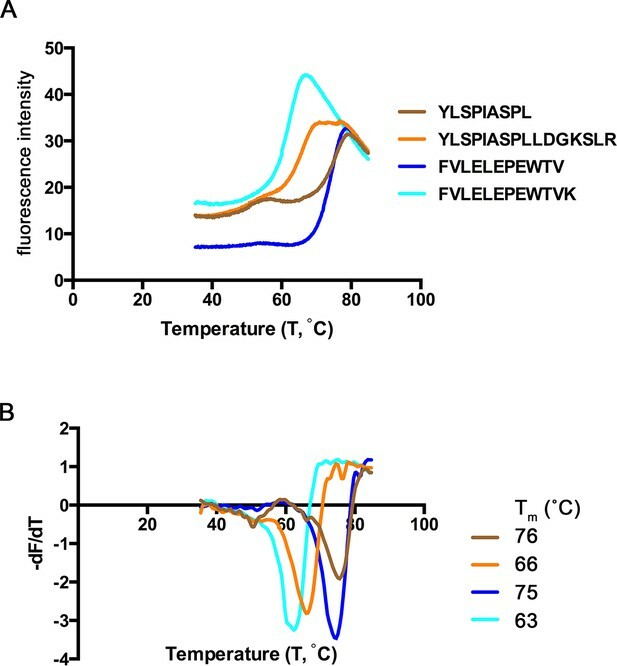 (B, C) Mutation analysis of FVLELEPEWTVK and YLSPIASPLLDGKSLR with non-permissive F’ pocket residues. Blue letters denote the mutated residue. All data shown are the results of two independent experiments run in triplicate or duplicate. P-values shown are the result of an unpaired two-tailed t-test. Next, the two extended peptides that bound in the in vitro binding assay were tested to see if the binding core of the full-length ligand was essential for binding. In order to assess the contribution of the putative core for peptide binding, HLA-A*02:01 binding assays were completed using the full length peptide, the binding core only, and a series of full length peptide variants containing non-permissive amino acid substitutions at the putative C-terminal anchor of the binding core. For FVLELEPEWTVK, the affinity of all 'mutant' peptides was significantly worse (t-test, p<0.05) than either the binding core or the native full-length peptide (Figure 7B). With YLSPIASPLLDGKSLR, all but one (L10E) of the mutants had a lower binding affinity in comparison to the wild type sequence (t-test, p<0.05) (Figure 7B). As YLSPIASPLLDGKSLR harbors a Leu at P9 and at P10, it could be that either Leu can serve as an F’ pocket anchor for HLA-A*02:01 and when the P10 was changed to an acidic residue like L10E, the P9 Leu was used as the F-pocket anchor. In summary, the binding core’s F-pocket residue is critical for long-peptide binding to HLA-A*02:01 such that C-terminal amino acid extensions of these longer ligands somehow protrude out of the groove in the vicinity of the F-pocket. Extended ligands YLSPIASPLLDGKSLR-RPL7A15-30 and FVLELEPEWTVK-UFP16-27 bound at high affinity to HLA-A*02:01, and we next assessed their relative stability when in complex with MHC I. To determine the relative stability of these extended peptide/MHC I complexes, we completed a thermal denaturation assay on the extended peptides and their respective binding cores in complex with HLA-A*02:01 (Figure 8). The melting temperature (Tm) for the two extended ligands exceeded 62°C (YLSPIASPLLDGKSLR, Tm = 66° C, FVLELEPEWTVK Tm = 63°C), temperatures that are consistent with ligands of conventional length (Hassan et al., 2015). The Tm of these extended ligands are also within the range of 15 mers that are reported to 'bulge' in the central portion of HLA-A*02:01 binding groove (Hassan et al., 2015). It was somewhat surprising that these extended ligands had Tm representative of canonical ligands, and more remarkable was that the thermostability of the binding cores was at least 10°C higher (YLSPIASPLLDGKSLR, ΔTm = 10°C, FVLELEPEWTVK ΔTm = 12°C) than their extended counterparts (Figure 8). Thus, extended ligands have a denaturation temperature consistent with those of conventional ligands, possibly due to the highly thermostable nature of their binding cores. Thermal denaturation of extended ligands. (A) Raw fluorescence of the melt curve for indicated peptide/HLA-A*02:01 complex. (B) First derivative of the melt curve from thermal denaturation experiment for HLA-A*02:01 indicated peptide ligand. The melting temperature for each peptide was calculated from the minima of these curves and is shown in the figure legend. To determine how C-terminal extensions protrude from the F’ pocket of MHC I, we bound the extended ligand FVLELEPEWTVK (UFP16-27) and its binding core FVLELEPEWTV (UFP16-26) to HLA-A*02:01, crystallized these two complexes, and solved their structures at a resolution of 1.5 Å and 1.87Å, respectively (Supplementary file 4). Both peptides bound in a zig-zag fashion in order to accommodate the core 11 amino acids in the antigen-binding groove (Figure 9A). The 11 amino acid core of extended ligand FVLELEPEWTVK interacts with HLA-A*02:01 in an almost identical manner to the shorter peptide, however, both the main chain and side chain of C-terminal Lys12 protrudes out the end of the binding pocket (Figure 9B). Electron density for both peptides was very well defined over the entire peptide length (Figure 9C,D). The N-terminal and C-terminal amino acid residues of the peptide provide the majority of H-bond and van der Waals contacts (Supplementary file 4). When attention was shifted to the F- pocket of HLA-A*02:01, with the shorter peptide this pocket was closed by the side chains of Thr80 and Tyr84 with Lys146 of the MHC I providing a lid or cover above the F pocket thereby burying the peptide’s C-terminal 11th residue underneath (Figure 9A,E). However, for HLA-A*02:01 in complex with FVLELEPEWTVK, the side chain of Tyr84 swung up and out by almost 90 degrees (Figure 9A,F), opening the binding groove so that a peptide might protrude from the groove at its C-termini. At the same time, Thr80 adopted a different rotamer, further opening the MHC I pocket toward the end of the α1-helix. Lastly, there was a subtle but noticeable increase in the main chain distance between the α 1 and α2-helices at the F’ pocket (Figure 9G). Together, these structural changes opened the F’ pocket and allowed Lys12 of the peptide to protrude from the pocket. Structural details of extended ligand binding to HLA-A*02:01. Binding of core peptide FVLELEPEWTV (A, C, E) and extended ligand FVLELEPEWTVK (B, D, F) to HLA-A*02:01. Peptides are shown as sticks, while HLA-A*02:01 is shown as a molecular surface with electrostatic potential contoured from -30kT/E to +30kT/E (positive charge in blue, negative in red). Peptide FVLELEPEWTV in green, and FVLELEPEWTVK in yellow. 2FoFc electron density is shown as a blue mesh around the peptide (2 Å radius) FVLELEPEWTV (C) and FVLELEPEWTVK (D) and contoured at 1σ Details of peptide binding to the F’ pocket of MHC (E, F). MHCI residues that form H-bond interactions (blue dashed lines) with the peptide are labeled. MHC residues that are critical for the F’ pocket formation are shown with electron density with same settings as in C and D. (F) Note how Thr80 (T80) and Tyr84 (Y84) change position upon binding of extended ligand FVLELEPEWTVK. Those structural changes are not seen in PDB ID 2CLR (orange) when superimposed with UFP (16–26) and UFP (16–27). We compared our structures to a previously reported structure of HLA-A*02:01 in complex with a peptide that also extends its C-terminus from the F’ pocket (Collins et al., 1994). While the authors anticipated the structural changes necessary to allow a peptide to protrude from the F’ pocket, the reported structure shows a minor structural change where Tyr84, the key player in opening the F’ pocket, rotates slightly but does not swing out, and Thr80 did not change its rotamer. A slight movement of the Lys146 side chain, which appeared to be sufficient to allow the small C-terminal glycine to stick up, was reported (Figure 9G). However, in this previously reported model, amino acids other than glycine could not extend from the F’ pocket due to steric clashes with the MHC I. Here, we have identified a previously unreported mechanism that allows pathogen-encoded C-terminally extended peptides to protrude out the end of the MHC I binding grove at the F’ pocket. The binding cores of these C-terminally extended peptides interacts with MHC I using the same peptide register of canonical MHC I binders. Proteins secreted by T. gondii have been demonstrated to be an important source of immunogenic MHC I peptide ligands (Grover et al., 2014). Indeed, the secreted dense granule proteins are the best-characterized source of peptides for presentation by MHC I, and our study confirms these proteins provide a number of MHC I ligands (Blanchard et al., 2008; Cardona et al., 2015; Cong et al., 2011). However, many of the ligands we observe originate from non-secreted proteins, including parasite cytoplasmic proteins. Enrichment in these proteins is unexpected given that most T. gondii cytoplasmic proteins are not secreted and their cellular location should sequester them from the MHC I peptide processing machinery. Further, we identified many hypothetical proteins sampled by MHC I. Proteomic data had previously been reported for all but one of these hypothetical proteins, and our data substantiates that these proteins are expressed by the tachyzoites within the infected host (Gajria et al., 2008; Treeck et al., 2011; Xia et al., 2008). Additionally, a little less than half (10/22) of the hypothetical proteins contain a predicted secretion signal sequence. These data represent a substantial contribution to understanding patterns of T. gondii gene/protein expression and demonstrate that secreted as well as non-secreted tachyzoite-expressed proteins are accessible to host antigen presentation processes. A previous study of MHC I and T. gondii indicated that ligands derived from the C-termini of T. gondii source proteins are immunodominant (Feliu et al., 2013), and it was suggested that a proteolytic insufficiency within infected murine cells meant that only peptides derived from the C-termini of T. gondii source proteins would provide ligands of optimal length (Feliu et al., 2013). Consistent with this, we found a dramatic C-terminal bias in the T. gondii derived ligands. However, it was completely unexpected that host-derived ligands in the infected cell would also display a C-terminal bias. Gene ontology annotation analysis indicated no bias in the cellular location of the source proteins for these C-terminal ligands (data not shown), so it does not appear to be a protein’s location within the cell that results in a C-terminal processing bias. How T. gondii is mediating this intracellular alteration in antigen processing and presentation is therefore an unsettled question, and it will be interesting to see if protein ligand sampling is also biased in the closely related parasite Plasmodium falciparum. One of the most striking observations in this study is that infection leads to the MHC I presentation of T. gondii ligands that are longer than baseline host ligands. Most ligands of considerable length are thought to be anchored to the B’ and F’ pockets of the MHC I groove via the peptide’s P2 and PΩ side chains, respectively. In such models the long peptide ligands exhibit a central bulge in order for the MHC I groove to accommodate the length of the extra residues (Hassan et al., 2015; Tynan et al., 2005). Consistent with this model, several long T. gondii ligands identified follow this P2/PΩ-anchor means of binding to MHC I. Rather unexpectedly, a group of long ligands did not follow this model but instead were predicted to bind via a canonical N-terminal binding core preceding the aforementioned C-terminal extension. A review of published ligand elution data confirms that C-terminally extended peptides are presented by membrane-bound HLA-A*02:01(Hassan et al., 2015; Chen et al., 1994; Scull et al., 2012), yet the considerable number of extended ligands observed in this in vitro model of T. gondii antigen processing and presentation merits future confirmation in vivo. That notwithstanding, structural support for the binding of extended peptide ligands in HLA-A*02:01 can also be found (Collins et al., 1994). In this example the nonamer binding core of a calreticulin peptide is extended by a single C-terminal amino acid that fits within the MHC I groove, yet this model was not consistent with T. gondii ligands that had as many as 30 C-terminally appended amino acids. In order to resolve this enigma, an HLA-A*02:01 crystal was solved with FVLELEPEWTVK and with a version of this ligand minus the C-terminal K. This led to the unprecedented observation that the C-terminal lysine at P12 displaced the Tyr84 residue at the end of the HLA-A*02:01 binding groove. As such, Tyr84 emerged as a “swinging gate” whereby a longer T. gondii peptide extended straight out the end of the HLA molecule at its C-terminus when Tyr84 assumed an alternate up and out position – the open gate. With the shorter peptide the Tyr84 was positioned down and in, assuming the traditional closed-groove orientation. A Tyr84 in the open position is consistent with several extended T. gondii ligands and a number of host ligands. This structural configuration is distinct from c-terminal extensions previously reported with C-terminal extension of covalently linked peptides (Mitaksov et al., 2007) and predicted configurations (Hörig et al., 1999) where the peptide travels up and over Tyr84. Note that Tyr84 modestly rotated to facilitate the reported binding of calretulin to HLA-A*02:01 (Collins et al., 1994), and the gate-open displacement of Tyr84 observed here confirms that the MHC I binding pocket is less rigid than previously realized. Importantly, this method of binding appears to be a major mechanism by which T. gondii and peptides are bound and presented in contrast to host-derived peptides where this mode of binding significantly less frequent. The increased frequency of extended peptides following infection suggests that T. gondii ligands emerge from a distinct pathway of antigen processing and presentation. Class I MHC peptide ligands are typically derived from the proteasomal degradation of cytosolic proteins, active transport by TAP into the lumen of the ER, further proteolytic trimming in the ER, and chaperone mediated loading into class I MHC prior to egress to the plasma membrane. In the case of T. gondii, parasites are contained within a fusion resistant parasitophorous vacuole (PV), making it necessary that alternative mechanisms contribute to T. gondii protein degradation, transport, and trimming prior to presentation. Current evidence shows that T. gondii proteins secreted into the PV can be retrotransolcated via the endoplasmic reticulum associated degradation (ERAD) complex from lumen of the PV to the host cytosol where they are routed to MHC I (Blanchard et al., 2008; Feliu et al., 2013; Grover et al., 2014; Gubbels et al., 2005). This process of presenting canonical peptide ligands from exogenous non-cytosolic proteins by class I MHC is referred to as cross-presentation (Blanchard and Shastri, 2010; Grotzke and Cresswell, 2015). The extended T. gondii ligands observed here do not seem to fit this model of cross-presentation as their C-terminal extensions suggest a lack of interaction with proteolytic agents of the host cytosol and as many T. gondii ligands are derived from proteins not secreted into the PV. Rather, infected cells seem to exhibit a distinct means of cross-presentation, almost as though extended ligands move directly from the PV or the pathogen itself to the host’s ER, forgoing exposure to carboxypeptidases found in the cytosol that are otherwise absent from the lumen of the ER. Indeed evidence of a semi-permeable channel between the PV and the ER might explain the presentation of extended peptides (Goldszmid et al., 2009). However it is that ligands of unusual length reach class I MHC, future studies of T cell immunogenicity to T. gondii, and possibly to other large intracellular pathogens, must factor the distinct environment of the infected cell into the identification of immune epitopes. In summary, this study reports how antigens encoded by the large intracellular pathogen T. gondii are processed and presented by the host cell’s MHC I. Studies of peptides that are naturally processed and presented by the MHC I of mammalian cells have historically used healthy, or uninfected, cells to provide the baseline understanding for how antigens are made available for immune recognition. A foundation has emerged whereby peptide ligands of 9 amino acids are enveloped into an MHC I binding groove such that the central portions of the peptide ligand are available for review by adaptive immune receptors, and a legion of structural and functional data support this paradigm. Here we see that thousands of peptide ligands harvested from the MHC I of infected cells also fit this canonical antigen processing and presentation model, but in parallel we observe that alternate and unanticipated mechanisms result from infection and play a role in making T. gondii available for immune recognition. That long ligands can extend from their C-termini in a linear fashion out the end of what was previously recognized as a closed MHC I groove was unexpected. Our findings raise a plethora of important questions that must now be addressed, including whether other large intravacuolar pathogens such as Plasmodium and Mycobacterium species mediate similar changes to MHC I ligand presentation, how infection remodels host cell biology to facilitate the delivery of long extended ligands to MHC I, and the impact that unconventional ligand presentation has on adaptive immune responses to infected cells. THP-1 cells acquired from ATCC (ATCC# TIB-202) were cultured in RPMI supplemented with 10% FBS. THP-1 cells were routinely authenticated by HLA typing using sequence based typing at the HLA-A, B, C, and DRB1 loci from an American Society for Histocompatibility and Immunogenetics (ASHI) accredited laboratory (ASHI#03-5-OK-07-1) (Lanteri et al., 2011). The reported HLA type of the THP-1 cells are HLA-A*02, -B*15, -C*03, -DRB1*01, -DRB1*15 (Battle et al., 2013; Tsuchiya et al., 1980). The observed HLA type of the THP-1 cells used in all experiments is HLA-A*02:01, -B*15:11, C*03:03, DRB1*01:01, DRB1*15:01. THP-1 cells were transfected with a soluble form of HLA-A*02:01 as previously described (McMurtrey et al., 2008). HLA in the supernatant was measured using a sandwich ELISA using W6/32 as a capture mAb and anti-β2m antibody as a detector. HLA producing cells were subcloned and used for T. gondii infection. Toxoplasma gondii strain RH expressing GFP was propagated on human foreskin fibroblasts cells acquired from ATCC (ATCC# SCRC-1041) cultured in DMEM supplemented with 10% FBS, glutamine and penicillin/streptomycin. Parasites were released from host cells by passage through a 27-gauge needle (Wiley et al., 2010) All host cell lines and parasites were routinely tested for Mycoplasma contamination with either the MycoAlert Mycoplasma Detection Kit (Lonza, Basel, Switzerland) or Venor GeM Mycoplasma Detection Kit (Sigma-Aldrich, St. Louis MO) and found to be negative..
HLA from uninfected and infected cells were purified as previously described (McMurtrey et al., 2008; Yaciuk et al., 2014). Briefly, THP-1 cells producing sHLA-A*02:01 were seeded into a hollow fiber bioreactor. For T. gondii infection, cells were expanded to confluence and then infected on day 27 with 3.72 x 109 parasites. Bioreactor supernatant containing HLA was collected and pooled over the course of the seven day infection. HLA was purified from both infected and uninfected cells using antibody affinity chromatography with an anti-VLDL antibody. HLA was eluted in 0.2 M acetic acid and further acidified to 10% acetic acid. Peptide ligands were dissociated from the alpha chain by heating to 75°C for 15 min. Alpha chain and β-2m were separated from the eluted peptides by 3kDa cutoff ultrafiltration. THP-1 cells were infected with GFP-expressing parasites in the bioreactor and cells were periodically sampled from the extra capillary space of the bioreactor. 1x106 cells were stained with 1 ug of the pan-HLA class I specific antibody W6/32 labeled with Alexafluor 647 and incubated at room temperature for 30 min to differentiate whole cells from cell debris and parasites. Cells were washed with 1% BSA in PBS three times and then fixed with 1% PFA for 15 min at room temperature. Cells and free parasites were measured using a BD FACS Calibur flow cytometer. HLA peptide ligands are were identified with a two-dimensional LCMS system as described (Yaciuk et al., 2014). Briefly, peptide pools were fractionated using high pH off-line reverse phase HPLC. Each fraction was dried, resuspended in 10% acetic acid, and placed into an Eksigent NanoLC 400 U-HPLC auto sampler system (Sciex). Approximately twenty percent of each fraction was injected onto a nano-LC column and eluted with a linear acetonitrile water gradient at low pH (Yaciuk et al., 2014). Eluate was ionized with a nanospray III ion source and analyzed with a 5600 Triple-TOF mass spectrometer (Sciex). Survey and fragment spectra for all fractions were analyzed using PEAKS (Bioinformatics Solutions Inc) and were searched against NCBInr database using Homo sapiens (ID: 9606) or Toxoplasma gondii (ID: 5811) taxonomy filters. For Homo sapiens searches a 1% FDR was applied and for Toxoplasma gondii a 2% FDR was used. All T. gondii unmodified peptide sequences were confirmed with fragmentation of a synthetic peptide. All source proteins derived from T. gondii were manually converted from NCBInr format to ToxoDB (www.toxodb.org) format including official protein names and gene symbols. T. gondii source protein gene IDs were used as input for the Gene Ontology Enrichment tool (Gajria et al., 2008). Enrichments were calculated using T. gondii strain GT1, and both annotated as well as predicted terms were considered. Reported p-values are the Bonferronii adjusted p-value. Predicted HLA-A*02:01 binding affinities were generated for all eluted peptides using NetMHCpan-2.8 (Hoof et al., 2009). The percentage rank score was used for all analysis. The percentage rank score indicates how strong a peptide’s predicted binding affinity is compared to a large pool of naturally occurring peptides. A rank score of 10% indicates that a peptide is amongst the 10% strongest binding random natural peptides for HLA-A*02:01. Peptides with predicted rank scores <=10% were classified as binders, all other peptides were considered non-binders. All non-binders were screened for potential nested HLA-A*02:01 binders by predicting the binding affinity of all overlapping 8–11mers within the eluted peptide sequence. A more conservative rank score <=2% was used to identify nested binders. If multiple nested binders were identified within the same eluted peptide, the nested binder with the strongest predicted binding affinity was selected. Permuted peptides were generated by scrambling the amino acid sequence of the eluted peptide and predictions were preformed in the same manner. Assays to quantitatively measure peptide binding to HLA-A*0201 (MHC I) molecules are performed essentially as detailed elsewhere (Sidney et al., 2001; 2008; Sidney, 2013). In brief, 0.1–1 nM of radiolabeled peptide is co-incubated at room temperature with 1 µM to 1 nM of purified HLA-A*02:01 in the presence of a cocktail of protease inhibitors and 1 µM β2-microglobulin. Following a two day incubation, HLA-A*02:01 bound radioactivity is determined by capturing the HLA/peptide complexes on W6/32 (anti-class I) antibody coated Lumitrac 600 plates (Greiner Bio-one, Frickenhausen, Germany), and measuring bound cpm using the TopCount (Packard Instrument Co., Meriden, CT) microscintillation counter. Under the conditions utilized, where [label]<[HLA] and IC50 ≥ [HLA], the measured IC50 values are reasonable approximations of the true Kd values (Cheng and Prusoff, 1973; Gulukota et al., 1997). Each competitor peptide is tested at six concentrations covering a 100000-fold dose range in three or more independent experiments. As a positive control, the unlabeled version of the radiolabeled probe is tested in each experiment. HLA-A*02:01 class I heavy chain ectodomain (residues 1–274) and human β-2 microglobulin (hβ2m, 1–99) were expressed as inclusions bodies and refolded as reported previously (Garboczi et al., 1994) with modifications as reported. Briefly, 15 mg of HLA-A heavy chain mixed with 3 mg of peptide (GenScript) was then added to the refolding mix and further stirred at 4°C for 72 hr. Final heavy chain:light chain:peptide ratios were 2.5:1:12 for peptides FVLELEPEWTVK and FVLELEPEWTV. Following refolding, refolding mixture was spun at 50000g to remove any precipitated protein, supernatant concentrated to about 3 ml and loaded onto a Superdex S200 HR16/60 gel filtration column. Fractions containing refolded HLA-A*02:01-peptide complexes were pooled, concentrated to about 10–12 mg/mL and used for crystallization experiments. 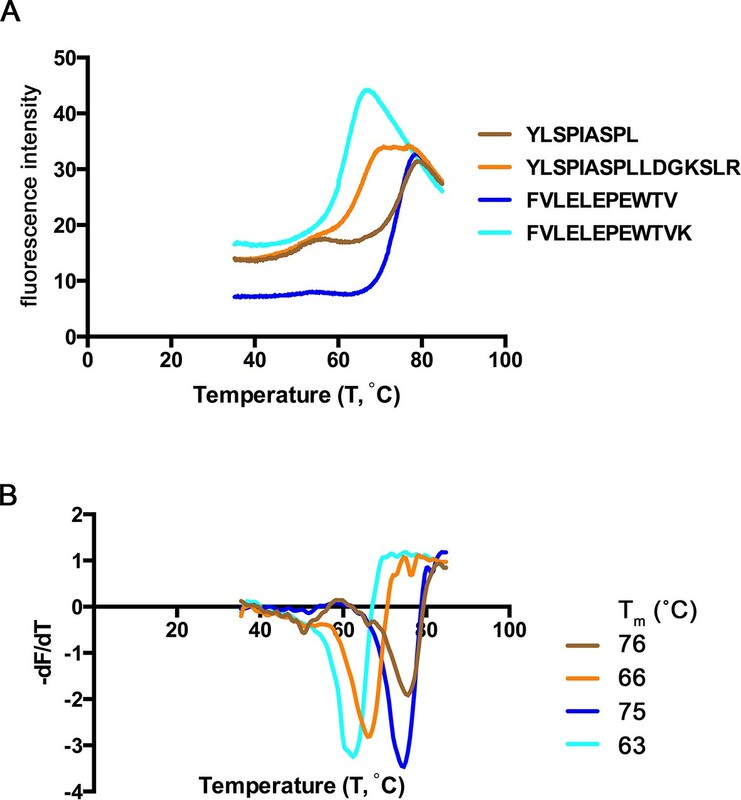 HLA-A*02:01-peptide complexes with peptides FVLELEPEWTV, FVLELEPEWTVK, YLSPIASPL and YLSPIASPLLDGKSLR were analyzed for thermal denaturation by differential scanning fluorimetry. HLA-A*02:01-peptide complexes at 100 μM in reaction buffer (20 mM Tris-HCl pH 7.5, 150 mM NaCl) were used as protein stock solution. Each reaction comprised of 1–2 μl protein stock solution, 2 μl of SYPRO Orange dye (100X, Invitrogen) made up to 20 μl in reaction buffer. The experiment was performed in triplicates for individual peptide complexes using a LightCycler 480 (Roche) in a 96-well plate format. A temperature gradient from 20°C - 85°C at steps of 0.06°C/sec and 10 acquisitions/°C was run. The melt curve of the total fluorescence was plotted against the temperature. The first derivative of the melt curve was obtained from raw fluorescence data (temperature differential of absolute fluorescence versus temperature) and plotted as well. The minima in the first derivative of each melt curve, corresponding to the inflection point of the original melt curve, provided the meting temperature (Tm) of each protein (Figure 8B) (Walden et al., 2014). Thin plate-like crystals were obtained for HLA-A*02:01 complex with UFP (16–26) in 30% PEG 5000 MME, 0.1 M Tris-HCl pH 8.0, 0.2 M lithium sulfate and HLA-A*02:01 complex with UFP (16–27) in 30% PEG 4000, 0.1 M Tris-HCl pH 8.0, 0.2 M lithium sulfate. Crystals were obtained by sitting drop vapor diffusion by mixing 0.15 μl protein and 0.15 μl of precipitant at 20°C after 2–4 days. The crystals were flash frozen in cryoprotectant (Reservoir solution: 100% glycerol - 3:1) using liquid nitrogen. Diffraction data for HLA-A2/ UFP (16–26) and HLA-A2/ UFP (16–27) were collected remotely at beamline 7.1 at the Stanford Synchrotron Radiation Light source (SSRL) and processed to 1.8 Å and 1.5 Å resolution, respectively using HKL2000 (Otwinowski and Minor, 1997). Phases were obtained using the protein coordinates for HLA-A2 (PDB ID 3MRE) using molecular replacement with Phaser MR (Storoni et al., 2004) in ccp4i (CCP4, 1994; Potterton et al., 2003) and provided unambiguous electron density for both the peptides. Model building was carried out using COOT (Emsley and Cowtan, 2004; Emsley et al., 2010). Structures were refined using Refmac (Deckert-Schlüter et al., 1994) to a final Rwork/Rfree of 0.164/0.222 for HLA-A2/UFP (﻿16–26) (PDB ID 5D9S) and Rwork/Rfree of 0.195/0.219 for HLA-A2/UFP (16–27) (PDB ID 5DDH). International Journal of Cancer. Journal International Du Cancer 132:246–247. Have we cut ourselves too short in mapping CTL epitopes? Acta Crystallographica Section D, Biological Crystallography 50:760–763. Acta Crystallographica Section D, Biological Crystallography 66:486–501. Journal of Molecular Biology 239:581–587. The Journal of Experimental Medicine 206:399–410. Are ERAD components involved in cross-presentation? Journal of Molecular Biology 267:1258–1267. The Journal of Biological Chemistry 290:2593–2603. Proceedings of the National Academy of Sciences of the United States of America 105:2981–2986. Acta Crystallographica Section D Biological Crystallography 59:1131–1137. Curr Protoc Immunol Chapter 18:Unit, 18, 10.1002/0471142735.im1803s100. Acta Crystallographica. Section D, Biological Crystallography 60:432–438. Cell Host & Microbe 10:410–419. International Journal of Cancer 26:171–176. The Journal of Biological Chemistry 280:23900–23909. Proceedings of the National Academy of Sciences of the United States of America 106:540–545. The Journal of Biological Chemistry 285:26852–26860. Thank you for submitting your work entitled "Toxoplasma gondii Peptide Ligands Open the Gate of the HLA Class I Binding Groove" for consideration by eLife. Your article has been favorably evaluated by Tadatsugu Taniguchi (Senior editor) and three reviewers, one of whom, Michael S. Gilmore, is a member of our Board of Reviewing Editors. The reviewers agreed that this manuscript describes has the potential to significantly advance our understanding of the repertoire of T. gondii peptides displayed by MHC Class I HLA-A2, and the extend our understanding of the nature of peptides bound and the manner in which they bind. 1) A comprehensive catalogue of T. gondii peptides presented by HALA-A2 is provided, expanding the current understanding by orders of magnitude. 2) Dense granules were found not to be the main source of T. gondii peptides presented, in contrast to current dogma. Many peptides derived from non-secreted cytoplasmic proteins. 3) Curiously, about a third of peptides presented were identical to counterparts in human proteins. 4) Unexpectedly, T. gondii peptides overall were about 40% longer than predicted – some much longer. 5) Long peptide binding appears to involve novel interactions with the HLA molecule. 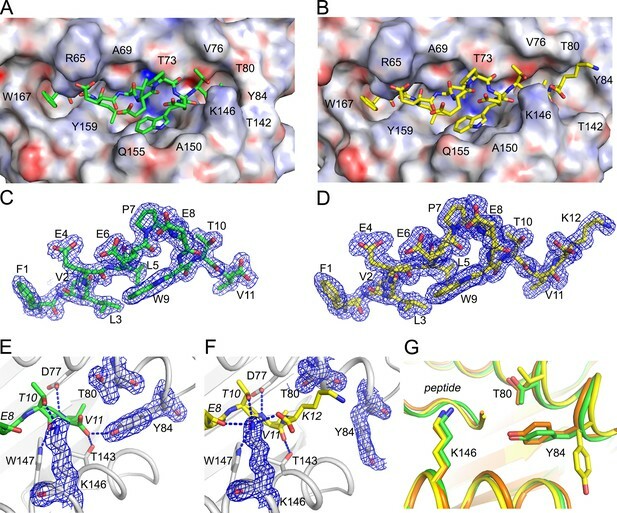 Crystal structural analysis showed that rather than forming a bulge, the large T. gondii peptides induce a conformational change in HLA that allows the C-terminal extension to protrude from the cleft. The following points were raised during review that must be adequately addressed before the paper can be accepted. 1) The conformational change involving Tyr84 in the FVLELEPEWTVK complex raises questions about the relative stability of the complex and/or the relative dissociation rates of the peptides, and the extent to which they may be functionally important. This could be resolved for example by measuring the stability of the complexes (e.g. melting temperature) or the dissociation rates of the peptides. 2) All of the peptide ligands are eluted from an engineered, artificial HLA-A2 molecule that is designed to be secreted from the THP cells. How does this change the dynamic between the sHLA and the peptide loading and editing machinery? How have the authors ruled out that the longer T. gondii HLA-peptide ligands are not an artifact associated with the secreted HLA protein? 3) Why does the distribution of T. gondii derived peptides skew toward longer peptides than the host derived peptides? (One reviewer noted that the difference in the distributions of host-derived ligands between infected and uninfected cells seem to be derived from a single experiment – is there more data to support this?). The potential for cross-presentation is not discussed, and this issue should be addressed. Essential revisions: The following points were raised during review that must be adequately addressed before the paper can be accepted. 1) The conformational change involving Tyr84 in the FVLELEPEWTVK complex raises questions about the relative stability of the complex and/or the relative dissociation rates of the peptides, and the extent to which they may be functionally important. This could be resolved for example by measuring the stability of the complexes (e.g. melting temperature) or the dissociation rates of the peptides. This is an outstanding point – characterizing the stability of these extended peptide/HLA complexes is positioned to further support the conclusions reached here. To address this point we have now performed thermostability assays on the two extended peptides YLSPIASPLLDGKSLR and FVLELEPEWTVK. We also completed a thermostability analysis with their respective binding cores. We find that the two extended ligand complexes are quite stable, having melting temperatures consistent with other reported HLA-A2 ligand complexes. Moreover, the core peptides, although they were never found to be presented, were considerably more stable, with a Tm of at least 10˚C above their extended counterpart. Thus, the extended ligands are stable in solution as compared to canonical as well as bulging peptide ligands while the core alone substantially increases the stability of the complex. In retrospect, it is likely that a highly stable core is key to the stability of the extended ligand. These data have been added as a new paragraph in the Results section of the manuscript along with Figure 8 that depicts these data. The reviewers raise a question that we now address in the revised manuscript. While it is possible that the extended peptides are an artifact associated with the secreted HLA protein, there are previous studies demonstrating that secreted HLA proteins are not significantly altered in their trafficking or in their peptide repertoires (Skull et al 2012). Specifically, a study comparing secreted HLA-A*02:01 and membrane-bound HLA-A*02:01 shows that the secreted HLA traffics and matures in the same manner as membrane-bound HLA, albeit at different rates. Furthermore, there is little to no difference in the ligand repertoires of secreted and membrane-bound HLA (Skull et al 2012). In regards to the presentation of longer ligands, these data have been quietly emerging for some time, yet nobody has characterized them to the extent we have here. One analysis of ligands eluted from membrane-bound HLA ligands shows the presence of extended ligands, although the frequency of extended ligands was not addressed (Skull et al 2012, Chen et al 1994, and Hassan et al 2015). Reports of ligand extension in mouse MHC class I provide further evidence of extended ligands (Horig et al 1999). Simply put, membrane preparations of HLA provide relatively small quantities of eluted ligand for characterization. Furthermore, extended peptides remain hidden in membrane preparations of HLA because ligands from 3-6 HLA are usually characterized simultaneously such that it is difficult to assign a binding core and HLA restriction to the extended ligands and are often left out of the analysis. Secretion provides a single HLA so that extended ligands can clearly be assigned to their restricting class I molecule. Finally, the ligands discovered in secreted HLA have successfully been developed into viral vaccines and human melanoma vaccines (1, 2), demonstrating the biological relevance of the secreted HLA model. In summary, there is a considerable body of data supporting the use of secreted HLA to more fully appreciate ligand repertoires. Secreted HLA reflects membrane-bound HLA as demonstrated in both biochemical and clinical studies, and secreted HLA provides perhaps the only approach to clearly assign extended ligands to their corresponding HLA. We nonetheless included, in the revised manuscript, a Discussion statement suggesting that future studies using very large scale in vivomembrane-bound HLA will more definitively demonstrate these data. Again, we are in complete agreement with the referees. To address this concern in the revised manuscript we have added a Discussion paragraph that briefly reviews cross-presentation and that expounds on possible cross-presentation mechanisms that might explain a possible mechanism by which extended T. gondii ligands access the class I HLA peptide loading complex. We feel that this added paragraph succinctly addresses the potential role of cross-presentation in T. gondii infection. 1) Carreno BM, et al. (2015) Cancer immunotherapy. A dendritic cell vaccine increases the breadth and diversity of melanoma neoantigen-specific T cells. Science 348(6236):803-808. 2) Kim S, et al. 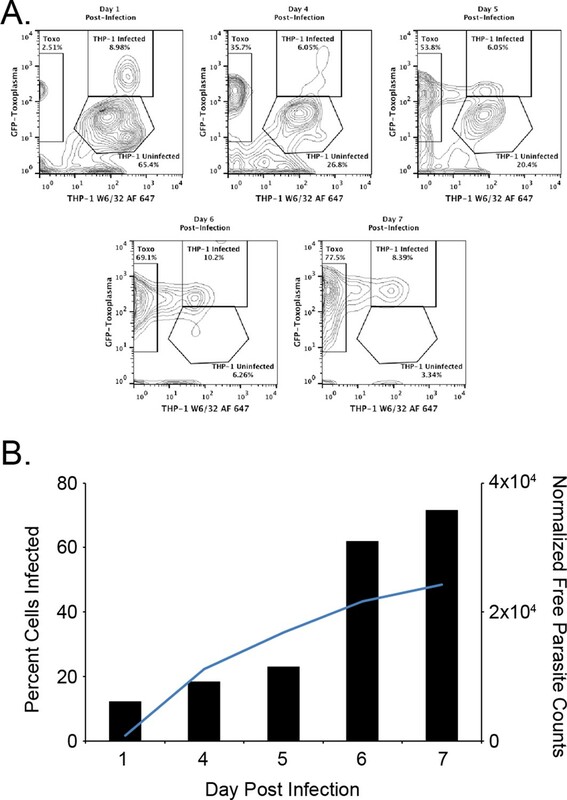 (2010) Single-chain HLA-A2 MHC trimers that incorporate an immundominant peptide elicit protective T cell immunity against lethal West Nile virus infection. J Immunol 184(8):4423-4430. This work was supported by: A subcontract to WHH and IB from NIH U19 AI062629-05 Coggeshall/Szeto, NIAID contract number HHSN272201200010C (to BP), DMID-NIAID U01 AI77887, R01 27530 (to RM), and The Research to Prevent Blindness Foundation (to RM). © 2016, McMurtrey et al.